The Department for International Trade (DIT) is the department of the British government that helps British companies export and grow into global markets. Total fashion sales in China are expected to treble by 2020 to the tune of £290 billion. With that in mind, DIT wanted to explore how they might help Chinese retail buyers discover, buy and establish relationships with British brands. We needed to find a partner who could help us refine our understanding of both sides of the market, distil this down to a tool that could be a genuine game-changer, and then build it; all whilst delivering excellence within tight timelines. We needed a platform that is designed to be re-usable for the long-term. Where to start? Nowhere better than Pitti Uomo, ground zero for men’s fashion and a veritable hotbed of international trade with more than 100 UK menswear brands in attendance each season. Over 30,000 fashion elite, from buyers to It kids descend on Florence to stock their stores and glimpse what’s new and next. With less than 3 months before this international trade show, DIT approached ThoughtWorks to design and deliver a digital tool for Chinese buyers who want to buy from British brands. 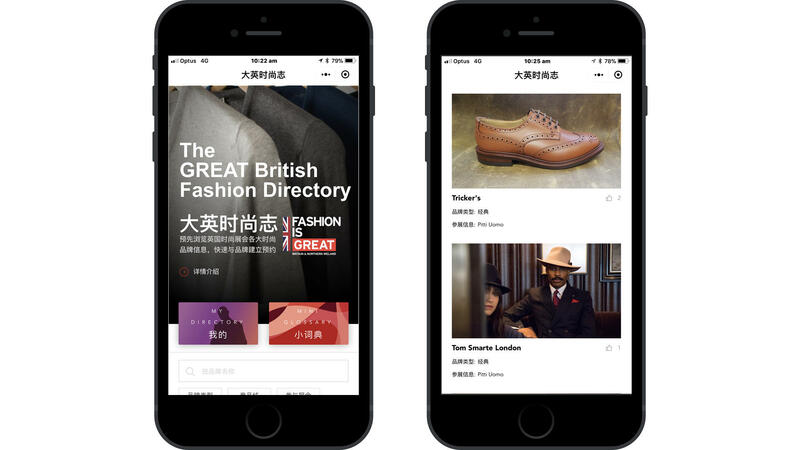 In 8 weeks, ThoughtWorks designed and delivered The GREAT British Fashion Directory platform, a WeChat mini program that helps Chinese buyers discover and build new relationships with British fashion brands at top fashion trade shows starting from January 2018. As a brand, we definitely need to be armed with ‘updated tools’ in order to attract and create new platforms for buyers to search and familiarise themselves with British brands exhibiting at Pitti and around the world. Given the international presence of Chinese buyers today, the WeChat mini program has proven to be an incredibly important tool and a great way to reach new clients that don’t necessarily know your brand. For us, we gained three brand new Chinese clients who found us via the mini-app! The first release of the platform (proof of concept) addresses key pain points in the buying process. It allows Chinese buyers to research British brands through brand pages in Chinese and run a filtered search according to their key buying criteria. Buyers that apply to be verified by DIT can contact and book appointments with brands directly, and British brands can prepare for appointments by viewing profiles of interested Chinese buyers in English, with the comfort of knowing that these buyers have already gone through an initial verification process. I registered as a verified buyer when the mini program was launched in December. I've found it very useful during Pitti as I could easily discover and locate British brands. Thanks to DIT we secured a new partnership with Ettinger, a luxury British brand. Only two months post-launch, the GREAT Britain Fashion Directory includes nearly 60 leading British menswear brands. The WeChat mini program has exceeded DIT's expectations during the Pitti Uomo trade show, attracting six times more users to engage with the platform than anticipated. The launch marks an important step in digitising the UK-China fashion connection. While the initial focus is on leveraging the platform for British menswear brands, DIT will look to widen the reach of the WeChat mini program to additional fashion categories in the near future.